Can we study the neurocognitive basis for code comprehension? ISR’s Christian Kästner and colleagues to publish research that outlines method for doing precisely that. Do we learn to program in a similar way to how we learn how to speak a foreign language? That is the question put forward by a group of researchers led by Dr. Janet Siegmund from the University of Passau - including ISR’s Dr. Christian Kästner - in the paper, “A Look into Programmers’ Heads”, which will be published in an upcoming edition of IEEE Transactions in Software Engineering. Using functional magnetic resonance imaging (fMRI) of the brain, the team examined the neurocognitive patterns of participants while performing two types of programming tasks. During the first, referred to as comprehension tasks, developers were shown code snippets and asked to identify the programs’ output. In the second, called syntax tasks, the same developers were asked to identify syntax errors in code snippets which, unlike the comprehension tasks, do not require the participant to form an understanding of the program. The study was conducted on an initial group of 17 participants and replicated with a second group. It showed, during program comprehension, dominant activation of the left hemisphere of the brain in functional areas related to working memory, divided attention, and language comprehension. Additionally, while participants did have to concentrate more with source code that was more complex, which is modulated by the familiarity with the underlying programming language, there was no correlation between programming experience and cognitive effort. To learn more, visit the team’s project website. 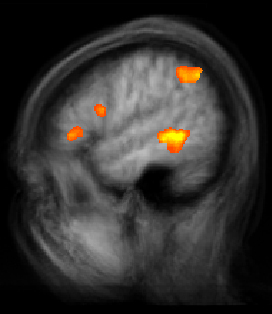 An aggregation of fMRI scan results of all study participants showing the areas of activity during programming excercises.